Home gardeners who wish to have glossy green shrubs that emit a sweet fragrance often choose members of the jasmine family for their gardens. While jasmines are best known for their aromatic scent, all jasmines are not fragrant. Other sweet- smelling jasmines, such as yellow star jasmine, are not true jasmines but are highly aromatic when flowering. Jasmine produces a sweet, rich fragrance when blooming. Common jasmine is also known by its scientific name Jasminum officinale, which are members of the Oleaceae family. Reaching heights of 20 to 30 feet, common jasmine is a seasonal bloomer. Common jasmine is often used in container plantings or pruned into an outdoor hedge. Confederate jasmine is also known by its scientific name Trachelospermum jasminoides. Considered one of the most fragrant plants for home gardens, confederate jasmine is not a true jasmine. Confederate jasmine grows best on steep banks, as ground cover or on a trellis or wall. According to the Missouri Botanical Garden, common jasmine is so sweet and fragrant, even a single vine can envelop the entire yard or garden in fragrance. 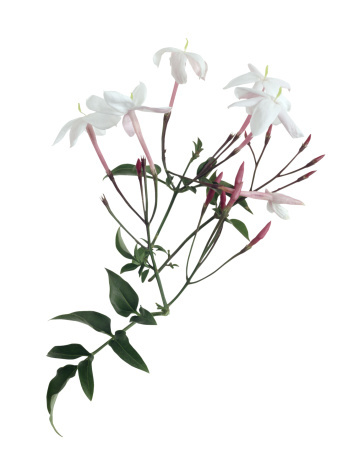 Common jasmine produces flowers in shades of white or pale pink that have a sharp, sweet smell. Confederate jasmine is characterized by lush, glossy green foliage and white blooms that smell similar to nutmeg. All jasmines grow best in full sun and in fertile soil. Jasmines require water during the hot months of summer, especially while they are getting started. Common jasmine can be grown as a vine or pruned into a hedge. Confederate jasmine will climb on a trellis or wall, up to about 20 feet. Without support, it makes an excellent ground cover. Jasmines are typically low-maintenance but are susceptible to whiteflies, mealybugs and scale insects. Common jasmine and confederate jasmine are both aromatic, fragrant evergreens that are a lovely addition to any home garden. Not all jasmines are fragrant, such as dwarf jasmine which produces yellow flowers that are unscented. Another jasmine, known as primrose jasmine, produces its unscented bright yellow flowers during the winter months.